How Sustainable Is Cameco Corporation's Dividend? Management has resisted lowering the dividend despite an onslaught of headwinds. Uranium has been one of the worst-performing commodities over the last several years. Long-term contracts for the element haven't exceeded $50 per pound since February 2014, while more volatile spot prices haven't seen that level since June 2012. Both tumbled to 13-year lows in the last two months of 2016 before recovering slightly to start the new year. Even with the recent bounce, one word could sum up the recent performance of and near-term outlook for the uranium market: abysmal. That has caused problems for Cameco Corporation (NYSE:CCJ), the world's largest uranium miner. In the last five years, the stock is down 50%, revenue hasn't budged, and once-healthy EPS has turned negative. Yet, amazingly, management has persisted in one key area: the dividend. The stock has distributed $0.10 per share each and every quarter since the beginning of 2011. The yield then was just 0.7%, but a long decline in the stock has pushed the yield to an impressive 2.7% with the same quarterly payouts. Investors may be wondering whether or not the dividend is sustainable and, if not, when will management be forced to reduce the payouts. The best way to gauge the sustainability of a company's dividend obligations is to dig into cash flow statements, which list all the money coming in and going out as related to operating, investing, and financing activities. There's even a line item showing the amount of dividends paid, in addition to the net amount of cash generated or used in a year. 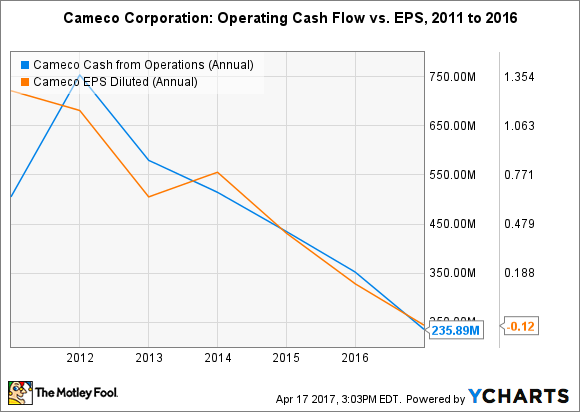 How much does Cameco Corporation spend on dividends? Thanks to a nearly constant number of shares outstanding, the company has paid out roughly $119 million in dividends every year since 2011. Whether or not that level of returning value to shareholders is sustainable depends on remaining cash flows. Unfortunately, operating cash flow has declined each year since peaking at $750 million in 2012. The trend has reached an unwelcome tipping point in the last two years: Cameco Corporation has spent more money than it has generated from operations. The company burned through $81 million and $103 million of cash in 2015 and 2016, respectively. While it had more than enough tucked away on the balance sheet to cover the industry's downturn, burning cash won't be sustainable much longer. It ended 2016 with just $240 million in cash. A dwindling cash position, and the relationship between cash flow from operations and EPS, makes it pretty clear that the company needs uranium prices to increase in the near future to boost margins and cash balances. Otherwise, management will be forced to make difficult decisions. CCJ Cash from Operations (Annual) data by YCharts. There's a pretty short list of hard choices available to Cameco Corporation at this point. Management could finance operations by offering debt, but it has maintained a healthy and consistent level of debt to assets in the last five years. It could look to further reduce capital expenditures, but there isn't much left to cut. Capital expenditures were slashed 67% between 2013 and 2016 -- and management has already included workforce reductions in its full-year 2017 guidance. That leaves a dividend cut, which, unfortunately for investors, makes the most sense in this scenario. Consider that the combined cash burn from the past two years ($184 million) was less than the total amount of dividends paid ($238 million). In other words, if Cameco Corporation had stopped paying a dividend at the start of 2015, then it would have reported a cash balance of $480 million at the end of 2016 -- twice what was actually reported. How sustainable is Cameco Corporation's dividend? It certainly wouldn't be a burden in a market accompanied by much higher uranium prices. However, if current market conditions persist for 2017 and 2018 -- and all indications suggest that will be the case -- then the dividend simply isn't sustainable. Investors could easily argue that the dividend hasn't been sustainable for the last two years, although that relies heavily on the power of hindsight. Long story short: Investors shouldn't be surprised to see a dividend cut in the near future. It may be one of the healthiest decisions management can make.